We took the teeny snuggle bug for a picnic at "our spot" yesterday. He doesn't do much yet, but he does throw (be they accidental) smiles every now and then so we're going to assume he likes it there too. I've eaten on that hill dozens of times and have yet to pack as simple a meal as I did last night. Things have changed, we keep telling each other that. It didn't matter that the salad only included greens, dressing and parmesan, we needed out of the house. Curran is 18 days old, just tipping the scale somewhere over 8 lbs., so strangers are quick to come and look at him and coo. Two ladies, moms themselves, came over to our blanket as we were packing up and told me how proud they were of us for leaving the house with such a wee one. They wanted to know how I was doing, commiserated about how painful the healing part is, assured us that eventually it won't take an hour to pack a simple picnic and get out of the house. Or maybe it will, but it will become normal. I love where we live, but strangers don't engage in conversation all too often around here. It's sad, really, that it surprised me how friendly these ladies were. I was taken back at first and then so grateful. So grateful for their honesty and enthusiasm and friendliness. It was a small gesture but it reminded me of our need for community, our need for other people to draw from our humanity and be warmed by chatting about what we have in common. Be it motherhood for 18 days or years. Noted: talk to strangers. Don't think of these bars as a healthy Fig Newton. They taste nothing like them in a very good way. They taste light and barely sweet. I've been enjoying a larger bar for breakfast with some yogurt or packing up smaller pieces for running errands...yes, I pack snacks for errands. I imagine you could make a puree of dried apricots for the filling or another dried fruit you fancy. Either way, I am always collecting snack bars recipes and this is a keeper. These make for a perfectly sweetened snack or breakfast option. 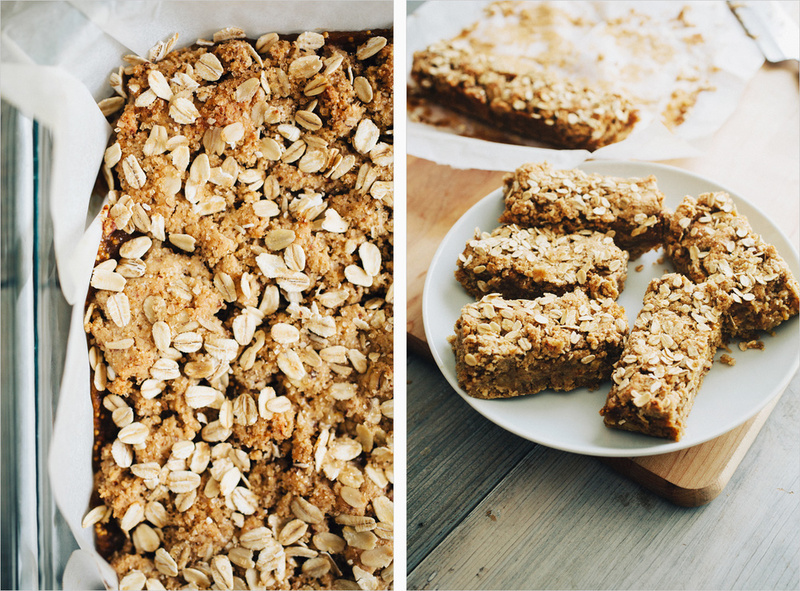 They are delicate and tender, so don't travel quite as well as your typical granola bar but are no less delicious. They are subtly sweet, not overly so which I really liked, but if you want more of a treat, simply add another few tablespoons sugar to the dough. These are wheat, dairy and egg free so work great for people with allergies. Figs come in two different colors, same goes for the dried variety. I used the lighter shade for these and it's the same color as the dough. Next time I will use dark ones so the contrast shows up. Tastes great either way but I'd prefer seeing the line of fig in between. Drain the figs, reserving the soaking liquid on the side. In a food processor, blend the soaked and drained figs with the honey and half the lemon juice. If your paste needs more liquid, add the soaking liquid 1 Tbsp. at a time. You want it thick, like jam, so use the liquid sparingly. 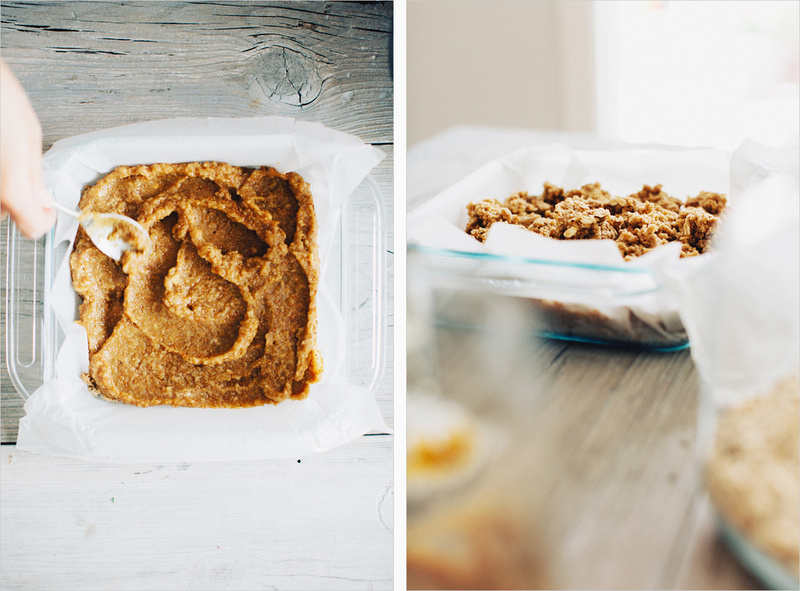 You can make the fig puree up to three days in advance. Preheat the oven to 400'. In a mixing bowl, combine the oat, brown rice and almond flours along with the baking powder, baking soda and salt. Mix to combine. Add the remaing lemon juice and zest, almond milk, almond butter, half the oats, coconut sugar and vanilla and stir everything together to combine well. Line a 9x9 baking pan with parchment paper extending up the sides. Crumble half the dough into the bottom of the pan and press it down with clean fingers. Spread the fig puree on top in an even layer. Crumble the remaining dough on top of the fig puree and press it down so it sticks together, being careful not to disrupt the fig layer. Sprinkle the remaining oats on top and sprinkle with desired amount of coconut or turbinado sugar. Bake on the middle rack for 25 minutes. Remove to cool completely. Remove the bars with the parchment and gently cut into bars with a sharp knife (I found mine to be quite soft. Put them in the fridge for an hour to firm up for a cleaner cut). Cover and keep stored in the fridge for up to a week.